J & M Home Improvements, Inc.
Let us take what you have and make it what you want! We offer quality workmanship at a fair price. We enjoy providing our customers with a quality job in an efficient amount of time. We offer one year warranty on labor and materials. 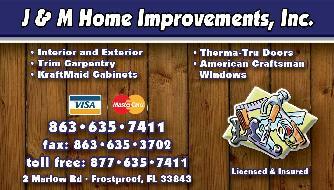 J & M Home Improvements, Inc. has been providing quality service in Polk County, Florida for the past 10 years. We specialize in custom kitchen and bathroom renovations, windows, interior and exterior doors, trim carpentry, and hurricanes shutters. You can count on us for all your home improvement needs. Our customer base has been built on "word of mouth" advertising. We have had the pleasure of finding solutions to whatever our customer's needs are. We have worked on small jobs from rotten wood repairs to large jobs consisting of major kitchen renovations. We are very pleased with the reputation that our company has earned. Our customers can depend on us to be very efficient, timely, polite, neat and clean. ♦ Homeowners Insurance discounts on hurricane protection! ♦ Hurricane Shutters can also provide Home Security! ♦ Kitchen and Bathroom renovations can increase your homes value by 15% or more! ♦ We can work with your budget!